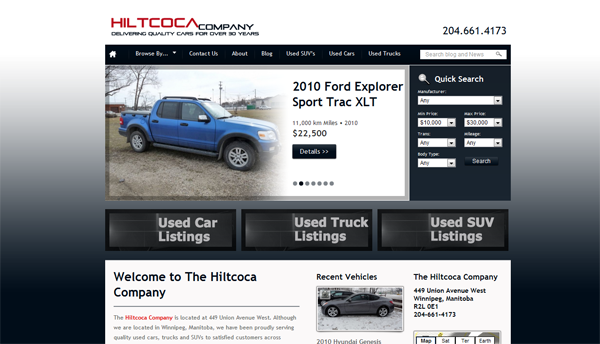 The Hiltcoca Company is a used car dealer located in Winnipeg, Manitoba who feature quality, pre-owned cars, trucks and SUV’s. They are a Certified Manitoba Used Vehicle Dealer whose commitment and enthusiasm has afforded them the opportunity to pass on great deals and quality products for over 15 years. Hiltcoca came to us looking to increase exposure. They needed an online presence that would allow them to showcase their inventory of used cars, trucks and SUV’s so we started by designing their website and are now working on creating an entire Social Media and SEO campaign to increase awareness. Our goal is to also integrate their offline campaign to reach the maximum audience and increase sales and traffic. Visit Hiltcoca at http://hiltcoca.ca and “like” them on Facebook at The Hiltcoca Company.